I may have caught the sewing bug. While perusing the pages of Modern Parents Messy Kids I found this Weekend Look Book and immediately fell in love with the featured child's robe. Adorable and so doable. It only takes a couple of towels and some bias binding. It reminds me of Edison's Day, not only is the 20 month old Edison smart, independent and the epitome of Montessori - he also had a super cute robe. I set to work. The tutorial can be found at made. I love sewing from tutorials and this one is simple. The only addition I made was a little tab sewn into the collar to make it easier for my Montessori child to hang it on his hook. The best part - the pattern starts at 9 months. That would be ridiculously cute! If anyone has used this tutorial I would love to see how it turned out. Don't you just love children after their bath, so beautifully snuggly and clean. We have the most awesome flower festival ever. Floriade. I've started to feel that Caspar could be more independent when baking. He could bake along side me, making his own thing rather than us baking together. How? I wondered. Honestly, everything we bake is simple and easy. But for him to bake on his own I found our most simple and uncomplicated recipe. By halving our recipe all of the ingredients fit into his child sized mixing bowl. He can mix much better using this bowl as he can grip it better (it also has a great handle). Now he can mix all of the ingredients together - no help needed. Halving the recipe means less volume, the recipe takes less time to complete. This is better suited to his concentration span. He obviously still needs a lot of help with the recipe but by looking at the pictures he can take leadership. Rather than me telling him what is required he can get started and I can help when needed. Illustrating is a bit like singing, your child doesn't even notice how bad you are at it. I find the old manual/dial egg timer works better too. It helps him to visualise the time it takes to bake. I give him control over the baking, he tells me when it is complete and we go to the oven together. Would you like our recipe? Yes? Mix together and spoon into pre-greased/lined mini muffin tray. Bake in oven at 180oC for 20 minutes. Let cool, then eat. Makes 12 mini muffins. This is the list I wish I had three years ago. With no Michael Olaf, no Montessori Services, where do we go for our Montessori materials? Today's five things are sources of Montessori materials that we have used and can recommend. 1. 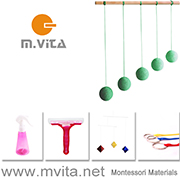 At Home with Montessori - Materials for children from birth to three years. 2. Montessori Child - I really like their practical life section. 3. A2Z Montessori Australia - They stock a large range of items, really comprehensive. 4. Bright Tomato Learning - A small but useful range. 5. Wood Puzzles - Puzzles, sandpaper letters, moveable alphabet. All handmade. We have also used Montessori 4 Kids which is an ebay store. Although I haven't used them before Classic Baby stock Montessori items for baby to toddler and they currently have a few items on sale. I also buy from Etsy. Most of these are from the U.S and Canada. I have found postage costs to Australia to be reasonable. I usually try to order a few items at time to make it cost effective. Locally I find our indepedent toy store to have some Montessori friendly toys. Although it may require some searching, hardware and kitchen specialty stores usually stock items relevant to practical life. 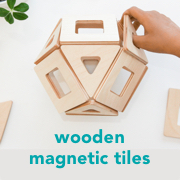 If you are in New Zealand have a look at Montessori Shop. Although I haven't used them before Vicki is super friendly and may be able to ship to Australia too. If there is a store that I have missed out or clearly don't know about please fill me in - I would love to hear about them! Five Things - Why read to your baby? I am a little late with my Five Things post. I actually had another topic in mind but I got distracted thinking about weaning, so I might post two Five Things this week. Today's five things - reasons to read to your baby. With Caspar (now three) I knew reading to him as a baby was important. I didn't know why. Now with Otis, my second child, I am much more aware and present as a parent and the reasons to read to him are abundant and oh so clear. This happens while I am showering and getting ready for the day. While it doesn't look like much sharing is going on, Caspar is actually reading to Otis. Caspar is sharing his book and sharing the story. He strokes each page with his hand. He feels the page, he touches the pictures, he touches the words. I can only imagine how amazing a book must look to him. He is learning the weight of a book, how to support it so you can view the words and pictures. He helps to turn a page. When I read to him like this, he barely takes his eyes off me. He is watching every word leave my lips. Reading time can be special. Touching, being together, taking time, expressing to him that he is important. Thank you to Cathy from A Montessori Home, the amazing photograph of Finlay reading with his dad here, really inspired me to capture some of our reading moments on camera. Also thank you to Caspar for the great photography. Like most kids Caspar likes to act like an animal. So when I found this very easy idea I thought it would be fun. You roll the dice then act like the animal shown. I was not disappointed, Caspar LOVES it and I have even found him playing it on his own. The free wildlife dice cutout can be found here at Wildlife Fun 4 Kids, there is even some ideas for noises to make. I really love this site as Penny has such genuine passion and enthusiasm for kids and wildlife. I really like her other post about gourmet duck food, although I haven't tried it yet. We don't usually feed the ducks, but here she explains not to feed them bread and provides a better option. Penny recommends printing on thicker paper, we didn't have any nearby so used ordinary paper. It's getting crumpled with use but still works a treat. Thank you Penny!